The main Olympic stadium in the west of Berlin. The partial roof was added in recent years as part of renovations. In this image you can see the cauldron; Berlin held the first Olympic torch relay. (Click on any photo to enlarge). 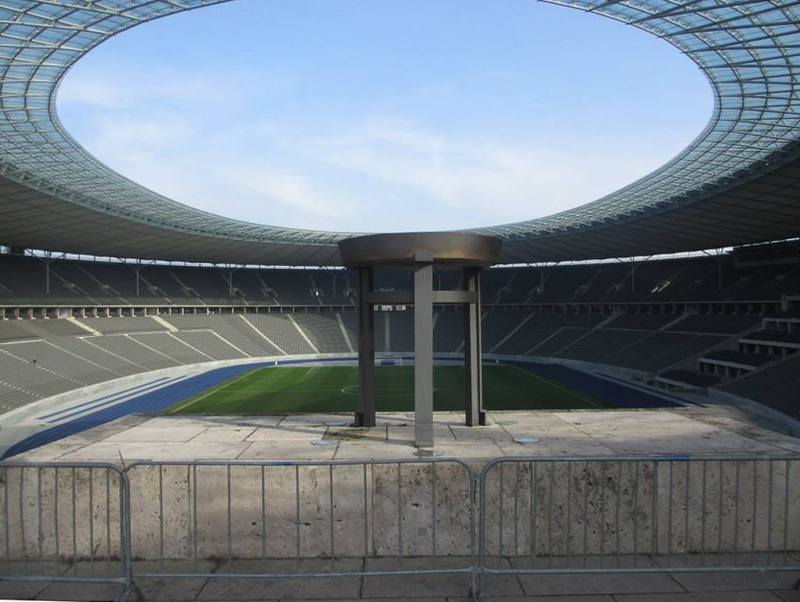 A few months ago my family and I toured the 1936 Olympic Stadium, restored in recent years to its original condition. Jesse Owens earned his glory here, perhaps the most famous athlete to emerge from those Olympics. The stadium is quintessential Nazi architecture, they say; it’s an imposing structure of concrete and marble, built to impress the world. The stadium lies in far western Berlin, just north of the Grunewald Forest. Many of the sports events of 1936 took place in this location, but not all. My family and I joined a tour and visited the lounges and halls of the stadium, sat in the VIP seats where Hitler and others once presided, and visited the locker rooms now used by Berlin’s beloved soccer team, Hertha BSC, much to the delight of a group of boisterous Brits who were far more interested in Fußball than in Olympic history. 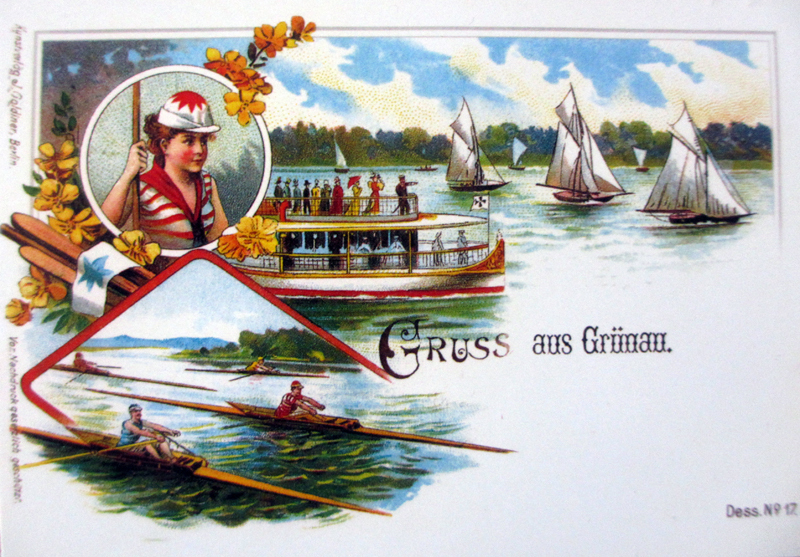 “Greetings from Grünau.” A turn-of-the-century postcard from Grünau, famous for its watersports long before the Olympics. To see the Olympic water sports arena would require a separate trip to the opposite end of Berlin, to Grünau. I made the trip to Grünau alone in early May. Convincing my family to see the main Olympic stadium was one thing; enticing them to see the rowing and canoeing course was beyond my powers. So, on a lazy Sunday when everyone else preferred to hang around the apartment, I took off on my bike and boarded an S-Bahn with it (a first!) and traveled out to see the site of the rowing course I’d read so much about in The Boys in the Boat. A used ticket to the rowing (“rudern”) races in 1936. The Wassersports Museum allows you into the area where tickets to the events were once sold to the public through tiny wooden windows. The Boys in the Boat covers the story of the surprisingly successful Depression-Era men’s eight from University of Washington. In particular it follows the story of an individual rower whom the author has the chance to interview in his old age. The eight wins regional and national races, finally securing a spot to race in the 1936 Berlin Olympics. The book paints a not surprisingly unflattering picture of pre-war Berlin, particularly the extent to which the city tried to present a modern, conservative image to the world to cover the country’s rising fascism, anti-Semitism, and undeniable progress toward war. The 1936 Olympic grandstand faces the water. It has not been modernized and remains as it was at the time of the Olympics. 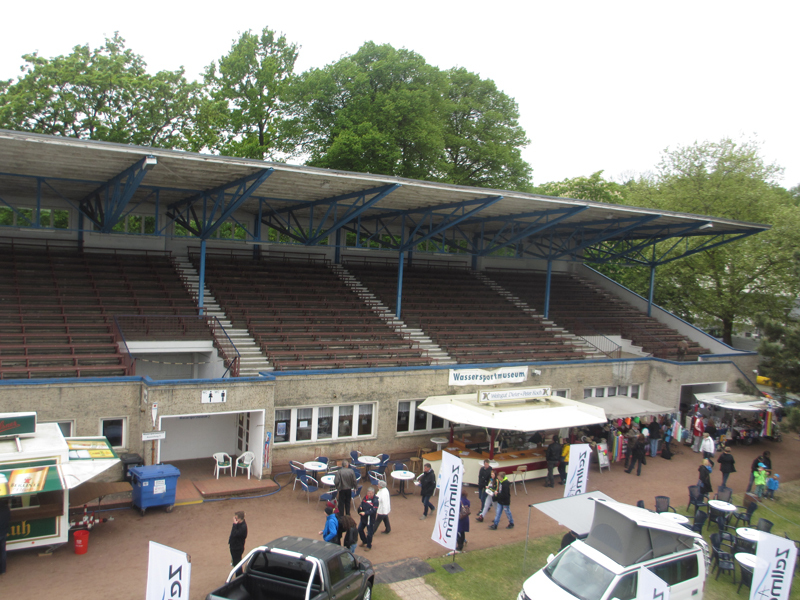 I found the Grünau grandstands without too much trouble; I attribute not getting lost to being on a bike. I arrived to find the grounds of the Grünau grandstands teeming with people for a watersports event, some sort of boat show. Potbellied men walked around with large glasses of beer and bored-looking women tagging after them, small children in hand. Exhibition speedboats went tearing across the water while kids bungee jumped in harnesses and bounced in an air-cushioned tent on the grassy shore. The air was thick with the smell of bratwursts and beer. 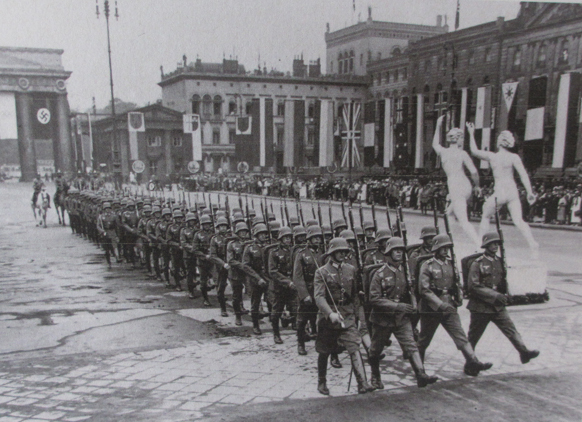 Elsewhere in Berlin… This image was presumably taken during the opening ceremonies of the 1936 Olympics (note all the other countries’ flags on the right). It hangs among the rowing and canoeing memorabilia at the Wassersports Museum. I tried to tune out the heavy pall of history when walking through the grandstands, but it was hard not to let my imagination roam. I have to admit I was trying to picture Hitler among the crowd, watching the regatta, waiting for his boys to win (in vain, as it turned out). 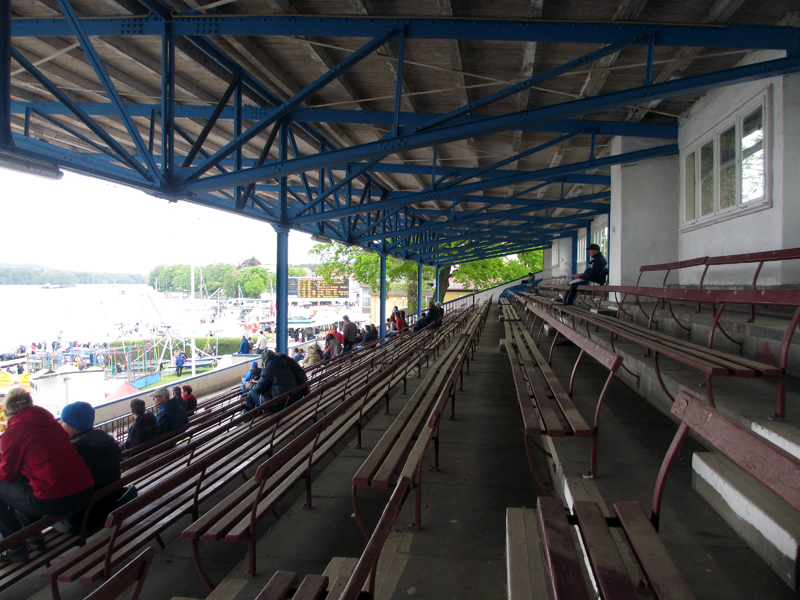 A look at the small crowd in the grandstands. Nothing much was happening on the water at this time. The benches were dusty from lack of use. Where the western Olympic Stadium has been renovated, the Grünau grandstands have been left to decay. They’re still usable, but nothing fancy. On the day I visited the wooden benches were thick with dust. A handful of people was scattered on the benches, but there wasn’t much happening on the water. Earlier Dietmar had mentioned that there’s a Wassersports Museum built under the grandstands, and by chance an employee was there and the door was open, so I went in. Inside I saw old wooden shells from decades past, as well as memorabilia from the 1936 Olympics and photographs of rowers who had raced there. A listing of the gold medals board hanging at the main Olympic stadium. Rowing gold winners (Rudern Sieger): Vierer Ohne-Steuermann (4-) won by Germany; Achter (8+) won by USA. 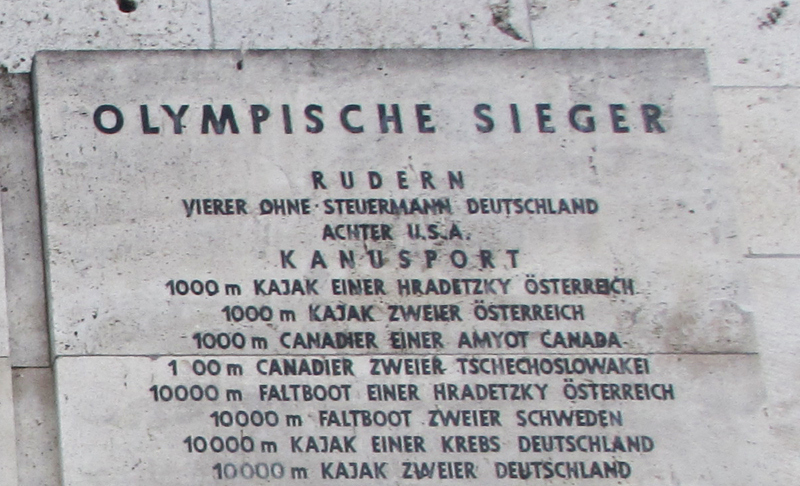 I had seen mention of the winning USA Achter (8+) at the main Olympic Stadium, but oddly at the site of the regatta itself there was no mention of the winning team. Though only two races were listed on the board of awards (see picture at right) there were seven races total, all men: 1x, 2x, 2-, 2+, 4-, 4+, and of course the 8+. Beyond the eight, Germany took gold in every other race except the double sculls, and they took silver in that. I found no mention of those other races, making it clear that the eight was the biggest prize, since it required the largest boat, the most men—the best way to show a country’s might. Here are the boys in the other boat, the “also roweds”; the German eight that took the bronze, the ones everyone expected to win. Having read Daniel James Brown’s glowing account of the winning USA men’s eight, it was interesting to be at the site of the Olympic race and see no mention of the winners at all. I could only find this image of the third-place Germans carrying their boat off the water. I expected them to look miserable in their defeat, though the bow (far right) seems to be smiling. Two seat must have bloodied his knuckles (that would explain the stained uniform). 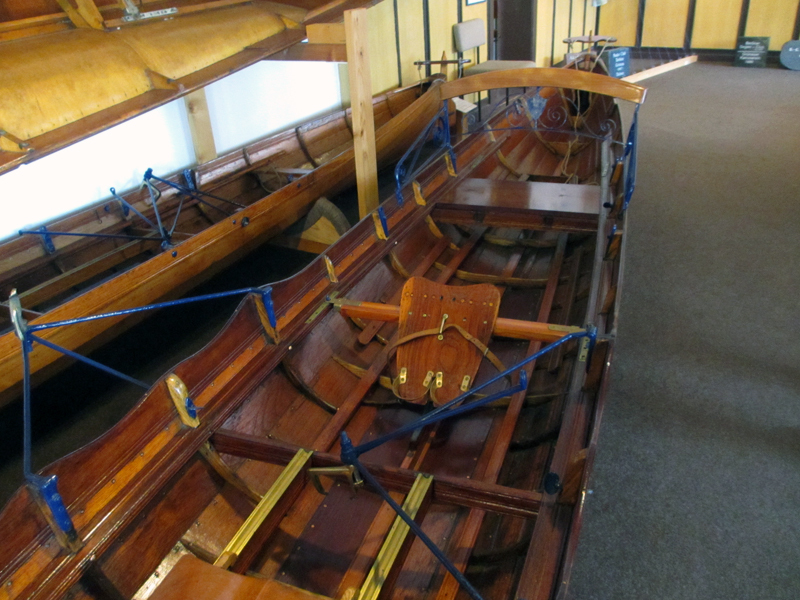 There were plenty of other items of interest at the museum, like this chariot of a coxed single, as well as photos of early women’s boats and the clothing they wore for rowing. I can’t help but share those with you here. 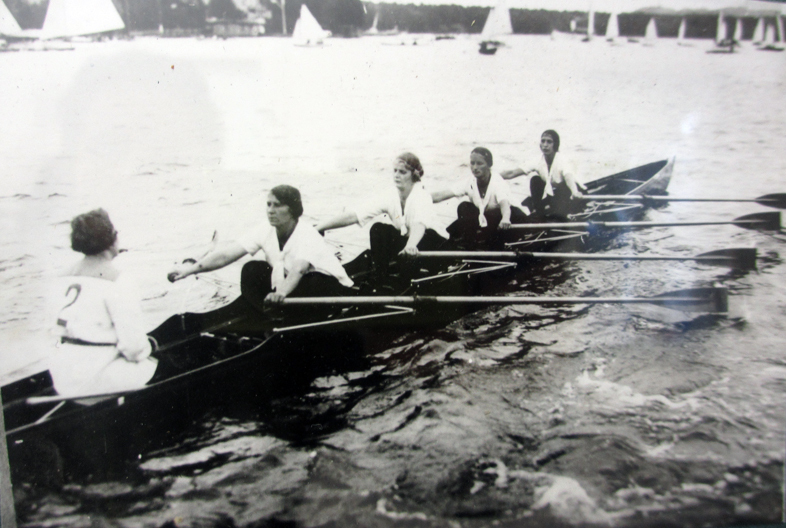 Women rowing at Grünau! Not in the Olympics, unfortunately. 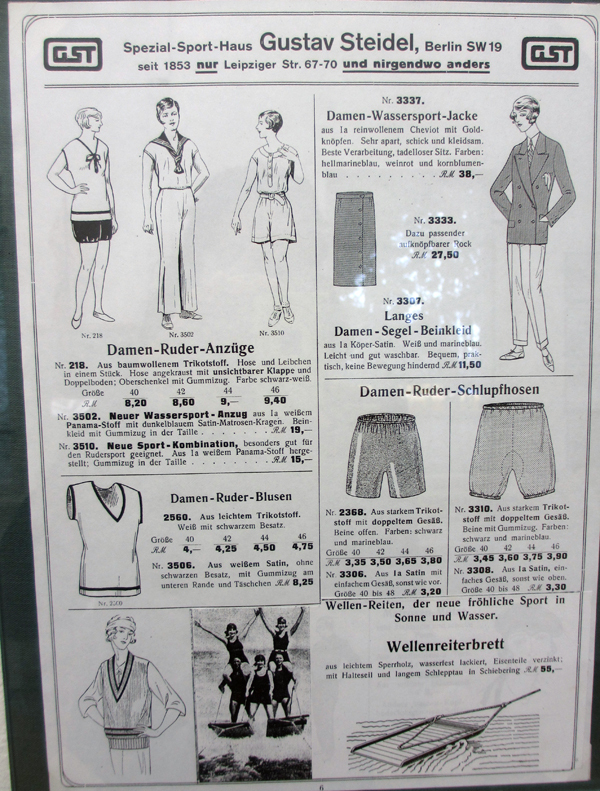 It’s really a shame those ladies’ rowing bloomers (schlupfhosen) went out of style. 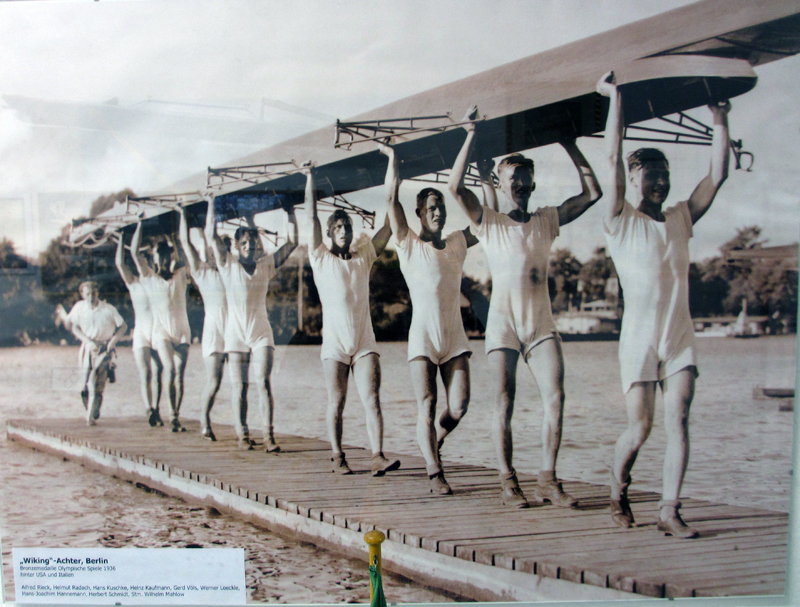 This entry was posted in History and culture, Rowing and tagged 1936 Berlin Olympics, Berlin, Daniel James Brown, Grünau, Hertha BSC, Rowing, rudern, stadium, The Boys in the Boat, Wassersports Museum on May 14, 2014 by Jill M..
Look in your centunary book! Thanks for the links and info, Dietmar! Here’s a better link to the Wiking club: http://www.rg-wiking.de. I will gladly look him up in my centenary book from RaW. Hannemann is your link to the Boys in the boat, because you know clubmembers that have been trained by him! That’s pretty wild to contemplate. Makes history collapse and the past seem fairly recent.